Ready to take the next step in your career and explore new job opportunities? Searching for new employment is exciting, but it is also confusing and stressful if you lack preparation. There are a lot of tips out there on how to shorten your job search, but one of the most crucial ways to expedite the process is to equip yourself with a strong resume. Before granting you an interview, hiring managers are looking for a resume that showcases your top qualifications in a compelling way and is completely relevant to the job at hand. To create such a document, use one of our great resume templates. These templates, along with our outstanding examples and advice, can guide you through the writing process and put you well on your way to securing a new position. Why Use Great Resume Templates? Start crafting an exemplary resume now. Peruse our large selection of great templates to find the perfect option for your industry. Draw employers in by using one of our contemporary templates to create a unique resume that resembles a newsletter or flyer. Multiple columns, bullet points with concise sentences, and unique colors and shading make for interesting designs that grab readers’ attention and leave hiring managers excited to learn more about you in an interview. Still unsure which of these great resume templates is the best option for you? Look at our selection of the most popular templates to learn which one is right for your industry and career level. Each one comes with unique styles and layouts to ensure your document is original, persuasive, and able to impress potential employers. Want to condense your qualifications to a single page? Check out our one-page formats. These great resume templates use the best organization tricks to help you fit your essential skills, achievements, and work experience on one page. This helps hiring managers read through your document quickly and discover your top qualifications almost immediately. Showcase your design skills when you use our creative templates. 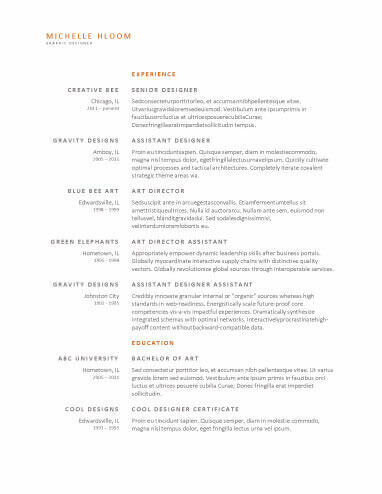 This document style displays your qualifications in a visually appealing way by using unique layouts and formats along with striking fonts, graphics, and color schemes. We offer over 40 of these great resume templates so you can choose the one that reflects your style best. Turn to our timeless basic templates to create a document that looks attractive and is easy to read both on paper and on the computer. These great resume templates are perfect for conservative or traditional fields, but their clean designs and organized formats also appeal to many employers across a number of industries and professions. Place standard contact information at the top of your resume. Write your full first and last name, leaving out any unprofessional nicknames. List an easily accessible telephone number but not your work number. Include a professional email that uses a current server, your city and state, and additional URLs, such as a LinkedIn profile, blog, or social media contacts if they are relevant to the position. Beneath your contact information, include either a summary statement or an objective statement. Most jobseekers use a summary statement, which illustrates how employers will profit if they hire you. Objective statements describe what you hope to gain from a new position and are appropriate for recent graduates and career-changing candidates. Whichever you choose to use, make sure it is concise and includes a couple of industry keywords to pique hiring managers’ interest. A winning skills section will utilize bullet points and short phrases so readers can skim through it within a few short seconds. List six to eight of your top relevant proficiencies, and include some of the desired skills listed in the description of the job to which you are applying. In this section, introduce each prior position by listing your official title, company name and location, and the dates you worked the job. Then detail your various duties and responsibilities, beginning each line with a dynamic verb. Use metrics such as numbers and percentages to quantify your achievements and paint a clear picture in employers’ minds of your professional capabilities. List your degree title, the year you graduated, and the name and location of the school you attended. Only include your high school if you did not receive further education. Feel free to include additional relevant information, such as licenses, certificates, seminars, and career development courses. In addition to our great resume templates, we offer a useful resume builder that can help you shape your document into an effective resume. It’s easy to use – simply choose your favorite design, answer a few questions about yourself, and download a finished personalized document ready to accompany applications to open positions. Creating the perfect resume may seem daunting, but with just a little bit of time, energy, and our assistance, you can successfully craft a captivating document that convinces hiring managers of your suitability for your desired job.